Five horses currently in Dubai have been made eligible for the 2019 Triple Crown . The Godolphin pair of Royal Marine and Royal Meeting are both Group 1 winners on the European turf, while Phoenix Ladies Syndicate’s duo of Walking Thunder and Superior have won on the Meydan dirt. Rounding out the quintet is Town Bee. Royal Marine, the pro tem leader on the European Road to the Kentucky Derby, banked 10 points (as well as the most non-restricted stakes earnings) by landing the October 7 Prix Jean-Luc Lagardere (G1). The Saeed bin Suroor colt was following up on a strong front-running maiden score at Doncaster, and hopes were that he would transfer his tactical speed to the dirt. 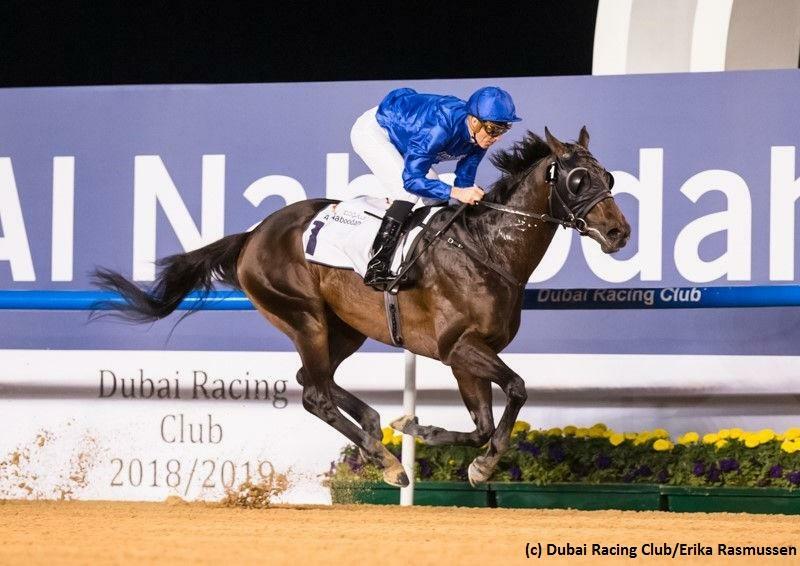 Royal Marine’s ambitions to become the next Thunder Snow took a hit, however, when he checked in a distant fourth to Walking Thunder in the January 10 UAE 2000 Guineas Trial at Meydan. Considering that Royal Marine got off to a sluggish start, and found himself in an unsuitable position for his running style – and for the typical race flow on the track – his effort was decent enough. As a homebred by Raven’s Pass, the 2008 Breeders’ Cup Classic (G1) winner on Santa Anita’s old synthetic surface, and a half-brother to current Group 3-winning dirt performer Secret Ambition, Royal Marine has a reasonable chance at surface versatility. A better start would provide a clearer answer. Stablemate Royal Meeting has yet to try the dirt, or any scoring race, and boasts a perfect two-for-two record. His profile is otherwise roughly parallel to Royal Marine, in that he stepped up from a smart maiden win at Yarmouth to capture a French Group 1, the October 28 Criterium International (G1) at Chantilly. The homebred Invincible Spirit colt is out of South African champion Rock Opera, making him a half-brother to the brilliant Meydan dirt runner Heavy Metal, winner of the 2018 Godolphin Mile (G2) on the Dubai World Cup undercard. Although Walking Thunder was riding high from his romp in the Guineas Trial, he did not stay atop his perch for long. The Florida-bred son of Violence was upstaged next time in the February 7 UAE 2000 Guineas (G3), settling for second behind Godolphin’s Estihdaaf . Yet another from the bin Suroor yard, Estihdaaf was not an early Triple Crown nominee, but it would be no surprise if he were added at the later nomination stage. The improving colt came up only a half-length short in his dirt debut (to Manguzi, see below), and the addition of a visor in the Guineas sharpened him up. Estihdaaf is by Arch and out of a full sister to multiple Grade 1-winning millionaire Better Lucky, who is in turn the dam of Kentucky Wildcat, the runner-up in Saturday’s Sam F. Davis (G3) at Tampa Bay Downs. Walking Thunder nevertheless remains an interesting prospect for his connections, the Phoenix Ladies Syndicate (affiliated with the Phoenix firm of Gronkowski fame) and trainer Ahmad bin Harmash. A bargain $42,000 purchase at OBS last April, Walking Thunder won his first three starts on the Meydan dirt by a combined margin of almost 19 lengths. He didn’t have as beneficial a trip in the Guineas, hung out wide as Estihdaaf saved all the ground on the rail. Bin Harmash’s other nominee for the Phoenix Ladies, Superior, has more questions to answer. The Kentucky-bred by Majesticperfection, bought at the same OBS April Sale for $50,000, scored in his unveiling at Meydan but disappointed last time in the January 24 Al Bastakiya Trial. Attending the pacesetter and eventual winner Manguzi, Superior appeared to be traveling well on the far turn, only to retreat to fifth. The about 1 3/16-mile trip might have been a bit too far for him, or perhaps he had another excuse. Manguzi, who was not Triple Crown nominated, was all out to stave off the rallying Estihdaaf. Town Bee, barring a radical turnaround, is unlikely to take up his Triple Crown nomination. Trained by Doug Watson, the Charles Fipke homebred has finished far up the track in both of his outings so far. The stewards’ report from his latest disappointment revealed that he’s been displacing his palate. If his breathing issue can get resolved, he’d have an opportunity to show his actual ability as a full brother to 2018 Metropolitan H. (G1) hero Bee Jersey. All five Triple Crown nominees – plus Estihdaaf and Manguzi – have been made eligible for the March 30 UAE Derby (G2) during the Dubai World Cup extravaganza. A scoring race worth 100 points to the winner on the main leaderboard, the UAE Derby is likely to attract contenders from Europe and Japan as well. In the meantime, the next stepping stone is the Al Bastakiya, over the same track and about 1 3/16-mile distance on the March 9 Super Saturday program.